The appearance in 1896 of the work of Roentgen on the x-rays determined me to publish immediately in order to settle the order of dates, a note on some particular radiations capable of passing through bodies, which I had been studying for two years and which were attached to no known phenomena. I called them by the name of Black Light by reason of their sometimes acting like light while remaining invisible. These radiations, which I had not had time to separate, at that period, were composed of three very distinct elements: (1) Radioactive particles of the family of cathode rays; (2) radiations of great wavelength; (3) radiations due to invisible phosphorescence. I have already set forth in The Evolution of Matter how I managed to distinguish these different elements in their order. The first of the three categories of radiations enumerated being identical with the cathode rays and radioactive emissions, it would be useless now to give them a special name. I shall therefore only designate by the name of Black Light: (1) the invisible radiations, totally unknown before my researches, emitted by certain phosphorescent bodies; and (2) the radiations of great wavelength, belonging to the infrared part of the spectrum. 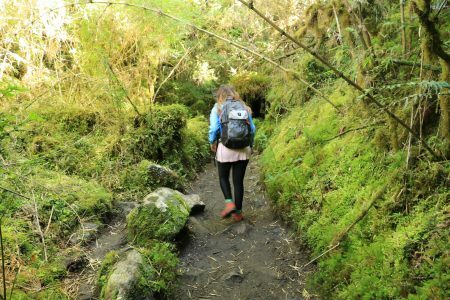 This region has been known for a long time, but the majority of its properties have been ignored. It was not suspected before my researches that these radiations passed through a great number of bodies, allowed instantaneous photography in the dark, and possessed very special physiological actions. The first category of radiations enumerated above have the same composition as ordinary light, and only differ from it by their invisibility. Designating them, together with those of the infrared, under the term Black Light, completes the continuous scale of invisible radiations. Black Light, then, comprises: (1) the invisible light emitted by certain phosphorescent bodies; (2) the invisible infrared light which in the solar spectrum goes up to 5 microns, and possesses consequently an extent ten times superior to that of the visible spectrum. I will now study the division of the Black Light constituted by invisible phosphorescence. When I published in 1899 and 1900 the experiments to the description of which this chapter is devoted, they seemed so astonishing to physicists that they preferred not to believe them. Yet the verification of the most fundamental of them was extremely easy, and demanded no other expense than 50 centimes in money and a few minutes of time. I now know, however, that several repeated them, but, astonished at their success, preferred not to speak of results which were evidently of no account, since official science had not consecrated them. Even today it is with great timidity that they are noticed in a few treatises on physics. Thus, for example, a distinguished scholar, M. Gariel, Prof. of Physics at the Faculte de Medicine de Paris, after having given a summary of them, says: “These effects are almost extraordinary. There is no occasion, however, to put them on one side, for the phenomena relating to radiations are certainly not yet all known” (Physique Biologique, vol. 11, p. 261). This quotation at least shows that if the discovery of new facts is sometimes difficult, it is still more difficult to get them admitted. 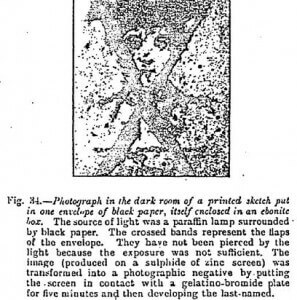 The invisible phosphorescence which I discovered is characterized by the following phenomena: (1) A phosphorescent body exposed to the light preserves for a period of about 18 months the property of emitting invisible radiations capable of refraction and polarization, and of impressing photographic plates. The spectrum of these radiations, which is analogous to that of light, only differs from it by its invisibility. (2) At the end of these 18 months, the body has no longer any appreciable radiation, but preserves indefinitely a residuum which can be made visible by projecting on its surface dark infrared radiations. These phenomena were completely unknown, and nothing warranted their being foreseen. No doubt it was known from all time that many bodies are phosphorescent by heat, and consequently have preserved since their geological formation an aptitude for phosphorescence which appears as soon as they are heated. But as these bodies radiate absolutely nothing in the dark before being heated, they give birth to no invisible phosphorescence. That which they manifest by heat is a very visible phosphorescence. Notwithstanding their long researches on phosphorescence, E. and H. Becquerel were ignorant of the phenomenon of invisible phosphorescence. Never did they suspect that bodies on which light had fallen for a minute could spontaneously emit in the dark invisible radiations during many long months. While knowing, as Canton had observed, that a phosphorescent sulfide, heated some time after insolation, again became slightly luminous for an instant, E. Becquerel supposed that the spontaneous emission of radiations quickly ceased, and that heat was necessary to expel the slight phosphorescent residue preserved indeed, but, according to him, never for long. This is, moreover, what he says in his book on Light (vol. 1, pp. 52 and 59): “When these substances are exposed to sunlight and placed in profound darkness for a short time — say, for 3 or 4 days — they almost entirely lose the faculty of shining immediately by a rise in temperature. Thus, the modification acquired by the action of radiation is only preserved in part and for a certain time in phosphorescent bodies, and then disappears”. The spontaneous invisible radiation produced without any intervention of temperature had thus escaped the notice of this eminent physicist. It is not at all true that “the modification acquired by the action of radiation is only preserved for a certain time, and then finally disappears”. We shall see that a part of the modifications impressed by light on phosphorescent bodies is preserved indefinitely and even after they have ceased to emit any invisible phosphorescence, which, however, only happens at the end of about 18 months. There are two forms of invisible phosphorescence: (1) the one following visible phosphorescence; (2) the one preceding it. They can both be easily transformed into visible light. The invisible phosphorescence which follows the visible constitutes one of the least known and most curious forms of light. It would have been difficult, before my experiments, to foresee that a body exposed for a minute to the sun and then kept in darkness for 18 months preserve the property of emitting, without cessation, radiations identical with light and only differing from it by an absolute invisibility. 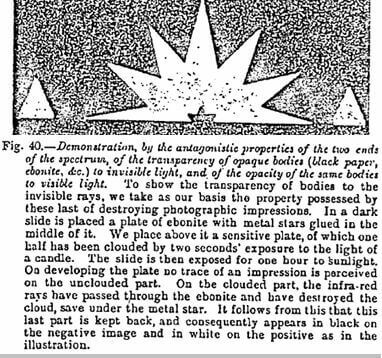 The majority of bodies struck by light preserve sometimes for a very long time the property of emitting dark radiations capable of impressing photographic plates. But it is with those capable of first acquiring phosphorescence that the phenomenon can be best studied. First, here are the experiments by which I determined the properties of the light thus emitted. Three days after the insolation, a very vigorous image of the negative is obtained in two hours. At the end of 15 days the exposure has to be for 12 hours; after 25 days, 30 hours; after 6 months, 40 days. At the end of 18 months traces of the image can still be obtained after an exposure of 60days. The above proves that the residual charge given by two seconds exposure to the sun has taken 18 months to gradually disappear. A statue coated with calcium sulfide dissolved in copal varnish is exposed for a few seconds to the light. Three or four days after it has become entirely dark, it is placed in a photographic dark room in a cellar into which the daylight has never entered. The focusing has been arranged beforehand. 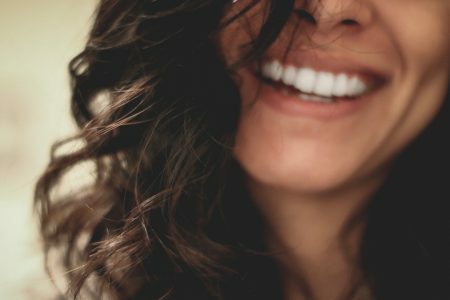 By using a portrait camera with large aperture, we obtain, by exposures varying from 8 to 15 days, images as perfect as those taken in daylight. The shadows vary at the will of the operator, since they depend solely on the position given to the stature during the insolation. (3) Polarization – The double refraction and consequent polarization of this dark light are shown by the following experiment: A strip of Iceland spar is introduced into the optic system of the camera previously used, and the statue is replaced by two glass tubes in the form of a cross, filled with sulfide and fixed in a place settled beforehand so as to obtain a good focus. By working as before, a few days after the sulfide has ceased to emit light, we see on one of the exes of the cross two partially superposed images, of which the intensity is one half less than that of the part not duplicated — which is in conformity with the theory (Figure 26). This experiment proves, at the same time, the emission of invisible radiations, their propagation in a straight line, their refraction, and their aptitude for polarization. (4) Composition of the Rays emitted – The perfect sharpness of the images obtained in the preceding experiments already proves that the index of refraction of the lenses for dark rays is the same as for visible light. Had it been otherwise, the preliminary focusing by ordinary light would not have been exact for rays of different wavelength, especially with the portrait camera employed, of which the focal depth is almost nil. But that is only an indication. To ascertain the composition of the active rays, it would have been necessary to disperse them by a prism and to photograph them. 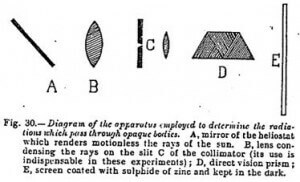 This experiment was not realizable on account of the necessity of employing, in order to obtain fairly clear photographs of the prismatic spectra, a very fine slit which absorbs nearly the whole of the light. The difficulty has been obviated by employing an artificial spectrum, composed of bands of colored glass fixed on a strip of colorless crown glass. This spectrum was first exposed to ordinary light over a sensitive plate, and the image thus obtained, after development, was compared with successive images obtained by interposing the artificial spectrum between the dark screen of sulfide and the sensitive plate. The images were identical in the two cases — that is to say, nil from the red to the green, and very intense under the blue glass. From these experiments we may conclude: — (1) That there is identity of composition between the visible solar light and the dark light emitted by bodies exposed to luminous radiations for a moment. The second only differs from the first by its invisibility, which results from the small amplitude of the waves emitted. (2) That this residual and invisible light lasts for a long time. We have just seen that certain phosphorescent bodies can for 18 months emit invisible radiations, but that a time arrives when the emission ceases entirely. We shall now see that those dark bodies, which after a period of radiation so long seem to have lost all their energy, preserve indefinitely a certain provision of residual phosphorescence. We shall render it visible at any moment — after a 10 years’ stay in the dark, for example — by letting certain invisible radiations fall on the surface of these bodies. They then become brightly phosphorescent enough to be photographed in a few minutes in the dark room. I noted this fact for the first time with calcium sulfide screens which had been used for my former experiments, and which no longer gave photographic impressions at the end of 18 months, even after 6 weeks’ exposure. They were then left in the dark, where they still are after more than 10 years. Let us put one of those screens in the dark into a plate-carrier, and cover over the glass with a sheet of black paper or a plate of ebonite, bodies opaque to ordinary light, but very transparent, as has been shown, to dark radiations of great wavelength. Let us expose this plate-carrier for 20 or 25 seconds to a paraffin lamp, and then take it into the dark to open and examine it. We shall find that, under the influence of the invisible radiations, the screen, which has been dark for so many years, has become luminous. Its phosphorescence is sufficient to give a photographic impression by contact in two or three minutes, while before it did not give one after 6 weeks’ exposure. The phosphorescence thus produced disappears rapidly, but the experiment can be repeated with the same screen more than 50 times at certain intervals — that is to say, for an indefinite number of years. There naturally arrives a moment when, the phosphorescent residue being exhausted by these successive experiments, the dark rays will produce no effect unless the screen is subjected to a fresh insolation. It is therefore really a case of a limited residual charge, which does not renew itself spontaneously, but which we can keep indefinitely before expending it. A large number of bodies possess in this way the property of acquiring a provision of residual light, a part of which disappears spontaneously, while the other part is preserved indefinitely. With some of them, such as calcium and strontium sulfide, the invisible residual light may become visible simply under the influence of dark radiations of great wavelength, even when the screen exposed to these radiations is maintained at a very low temperature — for example, between two glass troughs a centimeter thick, full of ice. Heat therefore cannot be given as the cause of the phenomenon. It is important to note this, for heat by itself can produce the same effect if we raise the temperature to 30° C. The action produced by heat is, moreover, very different from that generated by the dark radiation, as will presently be shown. The above experiments succeed very well with several phosphorescent sulfides, especially that of calcium, but not at all with zinc sulfide. The reason of this, to which I shall return elsewhere, is that the radiations of great wavelength, capable of destroying the phosphorescence of this sulfide, are totally incapable of exciting it. Zinc sulfide, like other sulfides, retain a residual charge indefinitely, but this residual charge can only be expelled by a temperature approaching 100° C, and not at all by the dark infrared rays. Many other bodies — the diamond, for instance — exist which can indefinitely retain a residual phosphorescence, which may be rendered visible by heat, and not by the infrared rays. A Brazilian diamond exposed to the sun acquired a phosphorescence which vanishes rapidly; but it retains an invisible phosphorescence which can be rendered visible after a few years by heating it to about 200° C.
Instead of effecting the preceding experiments with phosphorescent screens requiring some little preparation, they can be realized more simply by placing the calcium sulfide in a tube placed, after insolation, in a box closed by a sheet of ebonite, or, better still, by a sheet of glass coated with the so-called Japanese varnish, in a layer thick enough for the sun to be invisible through it (1). At the end of 24 hours, the sulfide will no longer shine, but when kept in the dark it will retain indefinitely the faculty of becoming luminous when the invisible radiation above referred to fall on its surface. To prove this, we have only to expose for one minute the box containing the calcium sulfide tube to a paraffin lamp. On afterwards opening it in the dark, it will be seen that the tube has become luminous. It is this very easy experiment that I alluded to at the beginning of this chapter. To render the preceding experiments still more demonstrative, I place at the bottom of a large cardboard box, closed as indicated above, some bas-reliefs coated with a layer of calcium sulfide, dissolved in bronzing varnish. This box is left in the dark. If, at some later period, it is exposed, still closed, to a lamp for two minutes, and then opened in a dark room, the statues will be luminous. The operation may be carried out several weeks after insolation. Up till now we have always used, to excite the extinguished phosphorescence, visible radiations passing through an opaque screen, which renders them invisible. But the experiment in this form allows it to be supposed that visible light has been able to pass through a chink in the box and to illumine the sulfide. We will now suppress all visible sources of light, place the observer in complete darkness, and in this darkness cause gradually to appear before his eyes a luminous statue which no ray of visible light has touched. In a dark room, or, if you do not have one, at night, the dark lamp described above, which allows no visible light to pass, is placed on a table. In front of it is a statuette coated with calcium sulfide which has been left for several days in the dark, and consequently presents no trace of phosphorescence. All being thus prepared, the observer sees, at the end of one or two minutes, the statue light up and come forth from the darkness. The experiment is a very curious one, and has always vividly impressed the spectator. 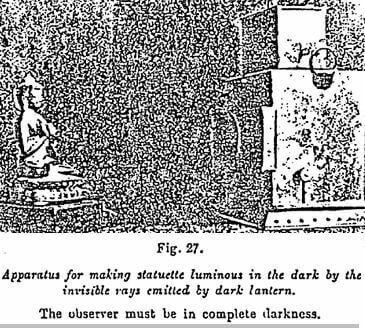 It is, in fact, very strange to see the dark radiations of the lamp, added to the dark radiations of the sulfide, produce visible light. It is almost the converse of the celebrated interference experiment of Fresnel, in which light added to light produced darkness. In my experiment, it is darkness added to darkness which gives birth to light. The light thus obtained is not very vivid. It is enough so, however, to enable a photograph of the statue to be takes with an exposure of 40 minutes, with a portrait camera suitably placed beforehand. The dark lamp, of course, is kept near the statue all the time the operation lasts, for if it were taken away, the phosphorescence would extinguish itself in less than a minute. 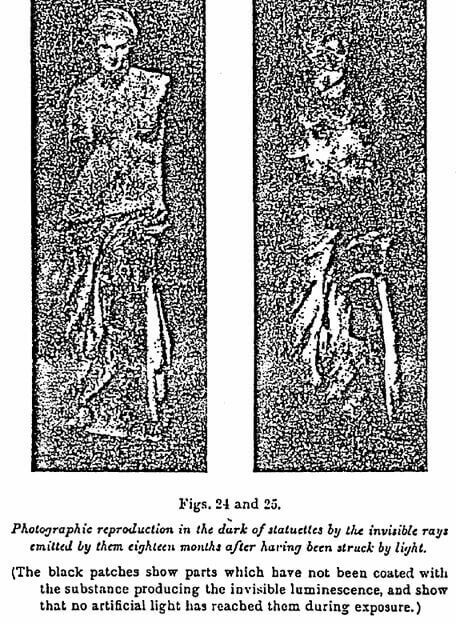 Figure 28 gives the reproduction of statuettes obtained by these means. The above proves that the residual luminosity stored up by certain bodies is formed of a transitory elements and a permanent one, both being capable of transformation into visible light. But while the transitory element disappears spontaneously by radiation in a greater or less space of time, the permanent element does not radiate spontaneously, but persists indefinitely until artificially expelled, either by calcinations or, without any rise in the temperature, by exposing the body to dark radiations of a certain wavelength. The invisible phosphorescence which, as we have just seem, follows the visible, may precede it. This is proved by the following experiments. Let us take a screen made of a phosphorescent body which is slowly impressed by light, such as strontium sulfide, and deprive it, by heat, of all residual phosphorescence. Let us then place it in the plate-carrier of a camera obscura having a diaphragm timed to 1/5 second, point the apparatus towards the sky, and uncover the diaphragm so that the plate is exposed to light for that period. On opening the frame afterwards in the dark, we notice that the sulfide is not luminous, but it will suffice to place it on a plate heated to 200° C for illumination to occur. Its short exposure to the light had thus given it an invisible phosphorescence. The experiment may be effected more simply with other bodies — Iceland spar, for example. This compound acquires a very slight visible phosphorescence by heat and none by light, but if insolated and then heated to 200° C, it shines with brilliance for some minutes, which proves that the light communicates to it a certain quantity if invisible phosphorescence. This series of operations can be repeated indefinitely — that is to say, we can restore to the spar the same luminosity by heat after having insolated it. 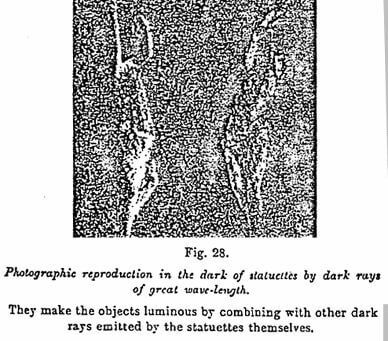 The first observers, having studied the action of the various parts of the spectrum on bodies capable of phosphorescence, very soon noted that the radiations going from the blue to the ultraviolet produced phosphorescence, and that those from the green to far on in the infrared extinguished it. H. Becquerel believed that he had found the explanation of this destructive action of the infrared, by saying that it acted simply as a source of heat, and consequently obliged the body to expend very quickly its provision of phosphorescence. This explanation has, from that time, been repeated in all standard works on physics. Yet it only required very simple experiments to show that it was founded on a mere appearance, which, moreover, does not exist with all phosphorescent bodies. The following experiments enable the parts played by the infrared rays and heat to be clearly differentiated. Fasten on the same cardboard two small screens, one of calcium sulfide, the other of zinc sulfide, and expose them, after insolation, to the infrared radiations of our dark lamp. The calcium sulfide will become more brilliant, but the zinc sulfide becomes extinguished directly without any increase in light. But this is only a first indication. I shall show that heat and infrared exercise on phosphorescence two very different actions. They may be added together, whence the error of interpretation pointed out above, but one of them may also act in the contrary way to the other. We will first examine the case in which these two effects, the specific action of certain radiations and of heat, seem identical. Let us take a screen of calcium sulfide, which has been insolated for 15 minutes, and expose it to the action of our dark lamp, either in front of the metallic chimney, or of the part closed by ebonite which allows the infrared to pass. In both cases the phosphorescence will first be made more active and then extinguished. Only the action of the heat is slower than that of the infrared, because it only acts when the surface of the screen has had time to get heated. The same results occur if we employ a screen which has been insolated for a few days and is consequently dark. It will shine in front of all parts of the black lamp — that is to say, by the action of heat as well as by that of the infrared. By confining ourselves to these experiments we should arrive at the conclusion, as did the earlier observers, that the infrared rays acted by heating the phosphorescent screen. To show the inaccuracy of this interpretation, we will repeat the preceding experiment, but interpose between the screen of sulfide and the lamp a strip of glass to prevent the heating of the phosphorescent matter. The effects will then be very different. In front of the ebonite, a region low in temperature, but which allows many of the infrared rays to pass, there will still be illumination. In front of the chimney of the lamp, a region fairly warm and acting as a heated body, there is no longer any illumination. The strip of glass interposed, which prevents the action of heat, prevents likewise the phosphorescence. It is therefore evident that the action of heat and of radiations of great wavelength are very different. It evidently might be objected to the above that if the infrared possesses the specific action I ascribe to it apart from the caloric power, the chimney of the lamp of which the action is prevented by the interposition of a glass should have an effect, since it produces infrared rays to the same extent as heated bodies. But as the heat of the walls of this chimney hardly exceed 100° C., the waves emitted have a length not less than 5 to 6 microns, and these have no specific effect on phosphorescence. They act solely by the heat they are able to produce after a certain lapse of time, which is why the interposition of a strip of glass suppresses all such action. Through ebonite, blackened glass, etc., there are emitted radiations of about 0.8 up to 3 microns, which possess a specific action independent of the caloric effect which they must produce in the course of time, and that is the reason they instantaneously act on phosphorescence. To render the above theory still more convincing, I will now show that the infrared can produce on the two halves of the same screen contrary effects, the one by its specifics, the other by its caloric action. For the calcium sulfide screen, let us substitute one of zinc sulfide with green phosphorescence. Let us insolate it by daylight, place one half in front of the metallic chimney of the lamp (that is to say, in front of a source of heat), and the other half in front of the ebonite which masks the flame and allows the infrared radiations to pass. On the two halves of the screen, the effects will be diametrically opposite. In front of the ebonite, the screen will become at once extinguished, without any preliminary increase of the phosphorescence. In front of the metal chimney, its phosphorescence will be, on the contrary, markedly increased. If, instead of having been insolated before exposure to the lamp, the zinc sulfide screen has remained for some time in a dark room, so that it no longer manifests any visible phosphorescence, the difference of action between heat and the infrared radiations will still continue to show itself. The screen will again become phosphorescent before the heated metal wall, and will remain dark before the ebonite, since the rays cannot destroy its visible phosphorescence owing to its being already extinguished (1). These experiments put in evidence the fundamental differences existing between the effect of heat and the specific action of certain radiations. The above demonstration may be completed by enclosing the phosphorescent screen between two troughs of frozen water 1 cm thick, before placing it in front of the infrared radiation of the lamp. Though its surface cannot, under these conditions, become heated, there will be observed in front of the ebonite effects of illumination in the case of the calcium sulfide, and extinction in the case of the zinc sulfide, as already described. It is therefore evident that infrared radiations may have specific actions quite independent of those produced by raising the temperature of the bodies absorbing them. Our experiments having proved that heat and infrared radiations are able in some cases to produce similar effects on certain phosphorescent sulfides — especially that of calcium — it became of interest to inquire to what temperature these bodies should be brought in order to obtain by heating them effects identical with those obtained at a low temperature with infrared radiations. Nothing can be easier, since it suffices to determine the temperature at which calcium sulfide, after being insolated for a few days, and thereby darkened, can regain its luminosity. This is effected by placing it in tubes introduced into a receptacle full of water containing in it a thermometer, and heating it gradually in darkness. We thus become aware that calcium sulfide which has been insolated for 8 days only commences to shine at 60° C, and not before 55 seconds, the time necessary to heat it. The same tube of sulfide becomes, on the contrary, instantaneously luminous when exposed at a low temperature to the action of infrared radiations. One may also wish to discover how much phosphorescence the infrared is capable if taking away from luminous sulfides, and thus fix its caloric equivalent. 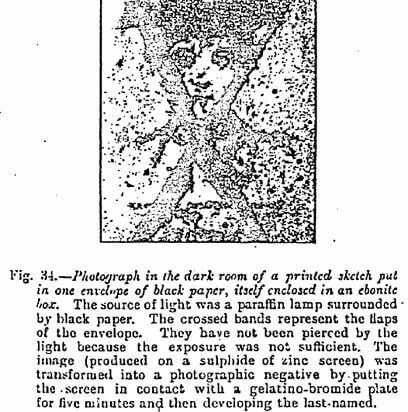 This is effected by introducing into a photographic plate-carrier, with a thin shutter of ebonite, a screen of calcium sulfide, and exposing it to the sun for several hours. It is then observed that, to restore its phosphorescence, it must be raised to a temperature slightly above 100° C. The great radiations acting at the ordinary temperature have therefore taken from a phosphorescent body all the residual light it might lose by heating it to about 100° C.
With invisible phosphorescence there are apparently — but only apparently — connected certain impressions obtained by bodies placed in contact, and in the dark, with a sensitive photographic plate. A gelatino-bromide plate is placed in a dark slide under a strip of metal — zinc, aluminum, or platinum. By interposing between the strip and the metal a cross made of various substances, we generally obtain, after a few hours exposure to the sun or to a strong paraffin lamp, an image of the object interposed, even when it is separated from the metal by a thin plate of mica. This experiment, and others of the same order which in former years caused me to waste much time, succeed very irregularly, and at the end of a few days the metal no longer gives any image. These effects are in no way connected with phosphorescence, but with the radioactivity of the metal, and this is the reason that they can be increased by slight heat. The absence of action on the metal — its fatigue, if we may call it so — is likewise observed, as I have shown, in the discharge of the electroscope. It is owing to the fact of the metal having expelled, under the influence of slight heat, a provision of radioactive substance, which cannot be regenerated without a long rest, that it becomes inactive. These radioactive actions, which I confused at the beginning of my experiments with those of the infrared and invisible phosphorescence, were the cause of many researches before I could distinguish them. From time to time different observers come across my early experiments, and, as Dr Russell, Dr Kahlbaum, and Prof Melander have done, observe afresh such impressions. The causes of these being determined, these experiments no longer present any great interest, and that is why I do not dwell on them. It is not metals alone, as I have already said, which may give such impressions, but wood and animal tissues also produce them [N-rays? — Ed.]. They are made more active by slight heat; but it is evident that with these different substances certain chemical reactions may also come into play. We have seen that the greater part of the solar spectrum is formed of invisible rays situated in the region of the infrared, and extending for sunlight up to 5 microns, according to the researches of Langley. The spectrum of flames is much longer still, and extends up to 60 microns. This very important region has hardly been studied hitherto, except from the point of view of its caloric properties. Having discovered that zinc sulfide with green phosphorescence was nearly as sensitive to a part of these radiations as was gelatino-bromide of silver to visible light, I was able to study their properties, especially the one of passing through a great number of opaque bodies. They allow us to see and to photograph through these last. These phenomena will be dealt with here, and the other actions of the infrared will be examined in a future chapter. For the eye to discern an object placed behind a body supposed to be opaque — a wooden plank or a piece of black paper, for example — it is evidently necessary that the rays should first pass through it. It is afterwards necessary that the eye should be rendered sensitive to these rays. The first of these conditions having always been considered as impossible, no one could dream of realizing the second. The discovery of x-rays proved that opaque bodies can, indeed, be traversed by certain radiations, but the properties of these radiations, created artificially by our instruments, could not modify the old ideas as to the opacity of bodies for light. The ancient fable of the lynx, whose sparkling eyes could see through walls, seemed destined to remain the most unrealizable of chimeras. This, however, is not the case. 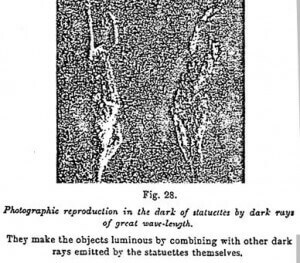 By pursuing my researches on the whole of the radiations designated by the name of Black Light, I was led to establish: (1) that the luminous rays, or at all events certain of them, passed without difficulty through a large number of opaque bodies; (2) that the invisible rays which pass through them can be easily rendered visible. If, then, our eye does not see through opaque bodies, it is not because luminous rays do no pass through, but because our retina is insensitive to these rays. If the eye of the lynx does not really possess the property conferred on it in the old legends, there is no scientific reason why it should not. It would be very easy to imagine an eye but little different from ours, and, moreover, possibly possessed by nocturnal animals, which should have the property of seeing through opaque bodies. It is this artificial eye, sensitive to radiations invisible to the human retina, which is realized by the following experiments. 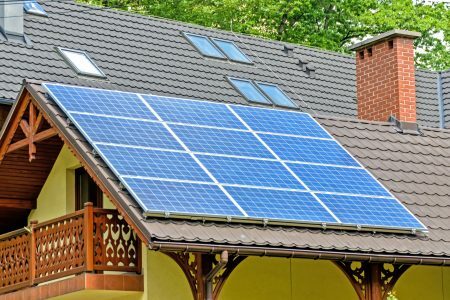 By means of a heliostat and a lens a pencil of light is conducted on to the collimator of a direct vision prism, and the spectrum is received, in the dark, on a screen of zinc sulfide gradated in wavelengths according to the formula of the prism used. This screen is previously rendered sensitive by a short exposure to light. After this exposure and before causing the spectrum to act on the screen, a portion of the part on which it is to fall is covered by a layer of the opaque body of which it is desired to study the transparency — say a sheet of black paper. By cutting off the spectrum after a moment and displacing the opaque strip, we immediately seem by the partial blackening of the phosphorescent screen under it, the region of the spectrum which has passed through it. It extends from 0.8 to 3 microns. Now let us examine how, by utilizing the properties of these radiation, a body enclosed in an opaque case may be rendered visible. We have simply to follow the explanations given below the above figure. In a few seconds the object enclosed in a box is seen outlined on the screen which covers it. The luminous source of which the rays pass through the opaque body is a paraffin lamp covered with black paper. The operator is therefore in complete darkness, in the midst of which there appears on the screen the objects contained in the opaque box. Of the various experiments realizable by the above process, the most striking is that of the visibility of an object enclosed in a box. This being placed in front of the invisible lamp, we see gradually appearing out of the total darkness in which the operator is the image of the enclosed object. When working with transparent screens of large size the effect is surprising. The invisible luminous rays are much less penetrating than the x-rays, and can in no way claim to take their place. 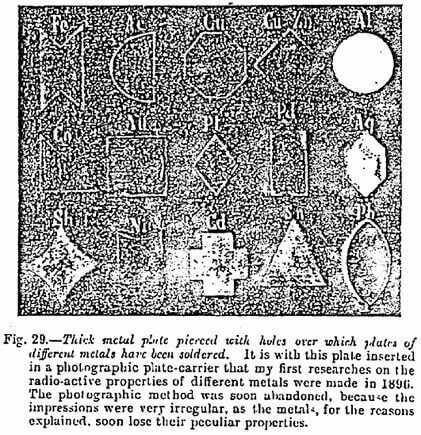 At the time of my first experiments in photography through opaque bodies, I was not aware of the sensitiveness of zinc sulfide to the infrared rays, and I made use of photographic plates rendered sensitive to radiations of great wavelength by having them previously made cloudy. The exposures then lasted hours instead of seconds. I reproduce later (Figure 40) one of the images thus obtained. A sheet of black paper is fixed on a glass plate, and on its surface is fastened a cross cut out of a thin strip of tin. This cross is covered with a second sheet of black paper, so that it is imprisoned between two sheets of this opaque paper. We now have to make it visible. A screen of zinc sulfide on cardboard is illumined by daylight and its surface applied against the strip of glass covered with black paper. The face next the phosphorescent screen is exposed for 10 seconds at a distance of 20 cm from a paraffin lamp. The whole affair is then carried into the dark room. On lifting up the phosphorescent screen there will be seen on its surface the image of the metallic cross which was enclosed between the two sheets of black paper. The above experiment is, moreover, the one I have recourse to in order to verify at once the transparency of the bodies, black paper, ebonite, etc., employed in my experiments, some samples of which turn out to be opaque by reason of the foreign bodies they contain. The zinc sulfide with green phosphorescence, being rarely met with in commerce, one can at a pinch replace it, in the case of the last described experiment only, by a screen of calcium sulfide; but it is indispensable that there should be an interval of at least 24 hours between the exposure of the screen to daylight and the time when the experiment is effected. If a screen recently insolated, and consequently very luminous, is used, no image is obtained on its surface. When these experiments were first published I gave away the little material enabling them to be repeated to all the learned men who asked me for them. A distinguished professor pf physics, Prof Izarn, wrote to me: “I hastened to effect the experiment with the material you were good enough to send me, and I was stupefied with the clearness of the results. 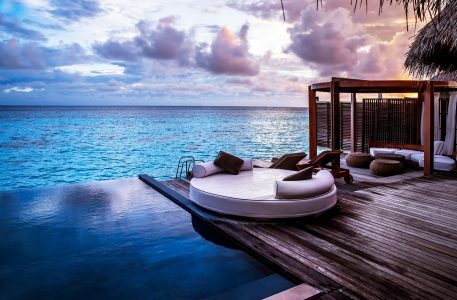 I should never have believed it would be so evident and so rapid”. It must be acknowledged, however, that the majority of physicists preferred to deny the exactness of my experiments rather than to repeat them. Others tried them with the aid of a photographer’s red lamp, which instantaneously extinguishes the phosphorescence of the zinc sulfide, and, naturally, observed nothing. It has been explained above (Figure 31) how objects enclosed in opaque boxes may be photographed. We will now vary these experiments by photographing external objects, such as a house, through an opaque body. For the realization of the experiments which now follow, various objects can be used. The most convenient is Japan varnish, which is poured two or three millimeters thick on the movable diaphragm of the focusing tubes, for the back of which is substituted a thin plate of mica fixed to the sides by strong glue. When the varnish is dry it will be observed, by interposing it between the sun and the eye, that it appears absolutely opaque. The object is to be reproduced on the ground glass of the camera is focused, and the diaphragm is put in front of the focusing tube. It thus constitutes an opaque body placed between the light and the roughened glass. A screen of zinc sulfide is then illuminated by daylight, and placed in the usual dark slide of the camera as if it were an ordinary photographic plate. Then lifting in the ordinary way the shutter of the frame, it is left open before the object to be reproduced for a period varying with the light. 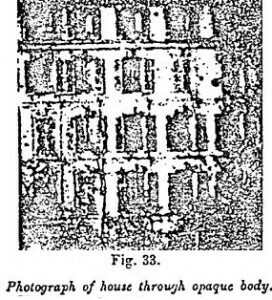 The photograph here given (Figure 33) is that of a house in daylight, and the objective used was a portrait lens. The exposure lasted one minute. The exposure at an end, the frame is closed and taken into the dark room, whence care has been taken to eliminate all (especially red) light. On opening the frame, we see on its surface the image of the object which was placed in front of the objective. In order to fix it, the phosphorescent screen is placed, while still in the dark, for 5 minutes against the surface of a gelatino-bromide plate, which is afterwards developed in the usual way. We have an image obtained by using the invisible rays of light. I give here (Figure 34) an image thus obtained. The want of clearness comes (1) from the focusing with great wavelengths only being possible by calculation; (2) from the phosphorescent screens used as sensitive plate having a rough surface. 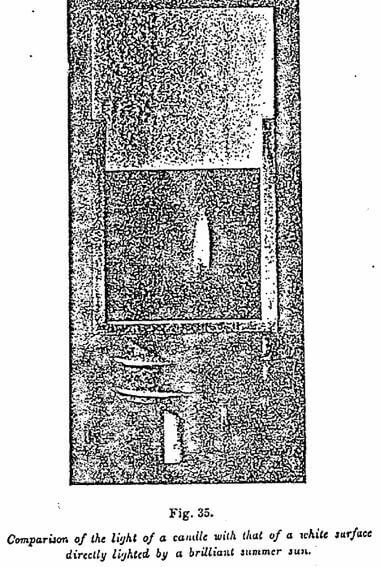 I said above that it was possible to employ very different substances as opaque bodies, but it must be remarked that with a ground glass no better image could be obtained than by placing a transparent ground glass before a focusing tube. Unpolished surfaces play, as is known, the part of diffusing screens. If we wish therefore to use as opaque body unpolished or badly polished matter, it is necessary to place it, not in front of the objective, but immediately in front of the phosphorescent screen — that is to say, in contact with it. It is useless to try the preceding experiment with calcium sulfide. The body is so little sensitive to radiations of great wavelength that even with an hour’s exposure no image would be obtained. Some of the experiments just described — that is, those where the object to be reproduced is enclosed in an opaque box interposed between the sulfide screen and the light source — succeed just as well with the light of a paraffin lamp or even of an ordinary candle, as with sunlight. This does not result only, as might be supposed, from the richness of artificial sources of light in infrared radiations. It is especially due to the fact that the brightness of the objects lighted by reflection, as is the case with all those examined in daylight, is immensely less than that of the source which lights them. An object brought very close to a candle has very little luminosity, but the flame of the candle itself is extremely luminous. Its radiancy is superior to that of a white wall lighted up by the sun at full noon in the month of August. This is shown by placing the candle against the wall, when the flame is brighter than this last. The fact that the brilliancy of a simple candle, or even of a modest match, should be ore intense than that of an object lighted by the sun having seemed inadmissible to many persons, I took some instantaneous photographs (Figure 35) of a candle enclosed in a lantern which almost entirely enveloped it, and at the top of which was a white cardboard lighted by the sun. When developed, we recognize that the image of the candle is more intense than that of the cardboard. This intensity of sources of light, notwithstanding their feeble illuminating power, may be shown likewise, by photographing instantaneously, and at night, a street lighted by gas lamps. None of the objects lighted up will appear in the photograph, but all the gas lamps will be reproduced. 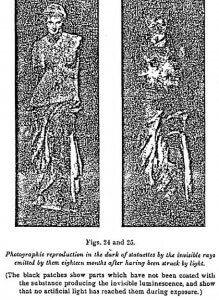 These observations allow us to understand the experiments which follow relating to instantaneous photography in the dark through opaque bodies. The experiment about to be described allows us to photograph in 1/30 second the image of a luminous source (a candle enclosed in an opaque box), then observer being himself in complete darkness. 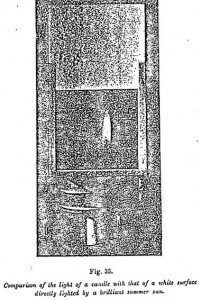 With a camera furnished with a wide focus-tube and a so-called instantaneous diaphragm, we focus in the proper position on the ground glass — so as to have an image of about equal size to the original — the flame of a candle or of a small paraffin lamp enclosed in a laboratory photographic lantern. The lantern is then closed with the opaque body chosen — black glass, ebonite, or Japanese varnish — fixed between two strips of glass. The observer is consequently in complete darkness. We then introduce into the dark slide of the camera a screen of zinc sulfide illumined by daylight, and we uncover the objective for the thirtieth of a second. On opening the slide in the dark there is seen on its surface the image of the source of light, which may be preserved by placing it against a photographic plate. The photograph represented here (Figure 37) was thus obtained. If the observer wishes to see the image form before his eyes, he has simply to use one of the transparent glass screens before mentioned, and open the back shutter of the dark slide to as to be able to observe what passes on the screen during exposure. The screen is transparent enough to show on its back the image formed on the front face. This experiment shows the astonishing sensitiveness of zinc sulfide with green phosphorescence to radiations of great wavelength, a sensitiveness approaching that of gelatino-bromide for visible light. Calcium sulfide does not allow this preceding experiment to be realized, nor do the sulfides of zinc with yellow or red phosphorescence. The transparency of bodies to radiations of great wavelength is never complete for the same body. That which we observe with the visible spectrum is equally true with the invisible. Transparency is always selective for each substance. The bands of transparency always border on those of opacity. There would have been no great interest, and it would have taken an extremely long time, to determine the regions which were transparent for each body examined. The transparent region determinable for sulfides goes from the extremity of the visible spectrum — i.e., 0.8 microns — up to 3 microns or thereabouts. In a general way, it may be said that the infrared radiations are more penetrating than those of the visible spectrum. Although not by any means a constant law, it is noticed that transparency seems to diminish as the wavelength is reduced. It is known that light is less penetrating the farther it advances towards the ultraviolet. At the extremity of this region, all bodies, even a glass plate 1/10 mm thick, become opaque, and to waves of the length of 0.1 micron a stratum of air 1 cm is as opaque as lead. But, I repeat, there is nothing absolute in this law. The transparency also depends on the structure of the bodies traversed. There are some which are very opaque for great wavelengths. It is for this reason, for example, that the atmosphere absorbs all radiations above 5 microns, and this is the reason why these latter do not figure in the solar spectrum. The radiations of higher magnitude — that is to say, from 5 to 60 microns — are only observed in flames, and most bodies have a rather low transparency with regard to them. The Hertzian waves, supposed to be analogous to light, on the contrary, easily traverse bodies which the great light waves do not penetrate. Bodies heated to a temperature not very high — that is to say, under 100° C — emit radiations hardly exceeding a length of 5 to 6 microns. They have also but little penetration. Melloui in the course of his experiments observed the fact, which was quite inexplicable in his time, that transparent bodies, like glass or quartz, were opaque for the waves emitted by a body heated to 100° C.
It will be remembered that this opacity is utilized in greenhouses in which glass bell-shades shelter certain plants. The visible waves of light pass very freely through the glass and heat the bodies on the inside of it. The latter become at once sources of radiant heat; but owing to their length, the waves emitted are unable to escape through the glass. They are thus imprisoned, and the plants do not become chilled. Radiations of great wavelength only appear to act on phosphorescent screens up to 3 microns or thereabouts. 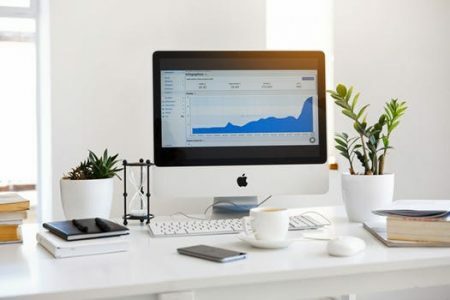 Screens may indeed be impressed at a greater distance, i.e., up to and beyond 6 microns, but by a very different mode of action to that utilized up to the present. The rays then act only by their thermal properties, and that is why their action only manifests itself at the expiration of some 30 seconds. The effect produced may be observed by covering a part of the screen with a strip of glass — opaque to these radiations — so as to have a field for comparison. A screen of slightly luminous zinc sulfide exposed for 30 seconds to the radiations emitted by a body heated to 50° C becomes slightly impressed. The radiations here act, I repeat, by their thermal action, and not by the specific action on phosphorescence utilized in the previous experiments. My method of observation of the transparency of bodies by means of phosphorescence is very simple. On one half of the transparent zinc sulfide and glass screen is placed the body serving as unit of comparison — for instance, a strip of chlorite 1 mm thick — and on the other, the opaque body of which it is desired to ascertain the relative transparency. I then take up a position at a fixed distance from a paraffin lamp placed in a dark room, the screen of zinc sulfide having been isolated by exposure to daylight. Its surface is protected by a metal plate, and when I am at a suitable distance from the lamp — 1 meter for example — the half not covered by ebonite is uncovered, and the light allowed to act on it for a given time — say, 5 seconds. Then covering up this part, and uncovering that over the opaque body of which it is desired to ascertain the transparency, we allow the rays of light to act until the intensity of the two surfaces is the same. If it takes 20 seconds to obtain this identity, I conclude that the body under experiment is twice as transparent as the ebonite taken as standard. As phosphorescent sulfides receive cumulative impressions, the transparency becomes a function of the time. We must then take the time as its ratio — which is what the method just indicated does. Black Japanese Varnish: even at a thickness of 1 cm, is transparent to such a degree that the rays passing through it impress the phosphorescent screen in 2 seconds. Even when less than 1 cm thick, it produces the impression in 2 or 3 seconds. Ebonite: half a mm thick, containing 1% lamp-black or metallic oxides; almost completely opaque. Black Paper: very transparent, but only half as much so as pure ebonite. Red Phosphorus in plates 1 mm thick: as transparent as ebonite. Wood, Stone, Marble, Grey Cardboard, Black Cloth: Transparent, but much less so than ebonite. Colored Glass: Very transparent, but red the least and orange the most so for the infrared. Bromine and Iodine: Still more transparent than ebonite. Fused Silver Chloride: cut into plates less than 1 mm thick; slightly less transparent than ebonite. Antimony, Lamp-Black, and Arsenic: very opaque. Ammoniacal Copper Sulfate, Potassium Bichromate (saturated solution), Water-Glass, and Alum (1 mm thick): transparent, but less so than ebonite. Iron sulfate (saturated solution, 1 cm thick): one-fourth as transparent as ebonite. The above shows that bodies formerly considered opaque for infrared radiation, such as alum, black paper, water glass, etc., possess, on the contrary, great transparency. When we wish to compare very rapidly the relative transparency of certain bodies, the following process may be employed: the substances to be examined are cut into bands and fixed on a glass plate, and then placed on a phosphorescent screen of brilliant zinc sulfide. They are exposed for 3 or 3 seconds in the dark to the radiations of a paraffin lamp. The darker the shade of the sulfur under these bands, the greater the transparency of the bodies. Of all the bodies enumerated above, the one found most opaque is lamp-black or the substances containing it. Black paper and ebonite which contain it — and that is frequent — at once become opaque. Before using them in experiments, it is therefore essential to examine their transparency, which only takes a few seconds. The opaqueness of lamp-black enables us to easily realize the following experiment, paradoxical at first sight though it is, viz., to reproduce, either by contact or by means of a photographic camera, a print placed in an envelope of black paper, and shut up in an ebonite box. He printing ink, which contains lamp-black, is not traversed, while its surrounding are, I have given in Figure 34 a photograph thus obtained. This opaqueness of lamp-black allows some of the rays to pass, but not the whole of them, since it arrests all those comprised between 0.6 and 3 microns. I have often repeated that throughout the visible, as well as the invisible spectrum, transparency is always selective — that is to say, that an opaque body is, like a colored glass, only transparent for certain radiations. When I published for the first time some of the experiments related in this chapter, the Minister of Marine of that time asked me whether it would be possible to mask, with an opaque body, the man-of-war or of a lighthouse, in such a manner as to render them invisible to the enemy and yet visible to those of one’s own vessels which were furnished with suitable apparatus. The solution to the problem was simple enough, but it has lost all practical interest at the present time, since the progress of wireless telegraphy which enables distant vessels to communicate with one another, and I therefore think it can do no harm to publish details of my experiments. Generalizing the problem, I sought to discover whether a ship could not project into a harbor, a fortress, or a town, rays of light invisible to the besieged, but visible to the besiegers, thus allowing a precise aim to be taken at the enemy while keeping the gunners invisible. The following problem therefore was set for solution: To render visible without rendering it luminous any obscure body — for instance, a vessel with its lights out in a dark roadstead. We must first consider that, when we project on to a dark body a pencil of visible light, this body is only rendered visible by the rays that it reflects. We know, on the other hand, that about 99% of the radiations projected by the best sources of light are quite invisible, and therefore unusable. So that, when we find the means of separating the visible from the invisible radiations, we shall only deprive our light of 1% of its total emission. The greater part of it will, consequently, still remain. The screens mentioned in the above possess this very property of eliminating the visible and allowing the invisible rays to pass. If a pencil of this invisible light is projected onto a dark body, this body will reflect it as it would ordinary light. It would therefore appear luminous to an eye capable of perceiving the invisible radiations reflected by it. Such an eye does not exist, but a phosphorescent zinc sulfide screen can take its place. Instead of the ground glass of a camera furnished with an objective of small focus capable of embracing a wide extent of the horizon, let us expose a screen of zinc sulfide previously rendered phosphorescent by means of a ribbon of magnesium r by the x-rays from a Crookes tube; there will then appear on its surface the image of the bodies in darkness, on which has been projected a pencil of invisible radiations. This invisible light will simply come from the reflection of that sent by the electric searchlight carried by all warships, the visible rays of which we shall have previously masked by means of an opaque plate. This plate must not be made of ebonite or black paper, as used in our preceding experiments, for the reason that they would be promptly destroyed by the heat. The only available body is black glass, of which there exist varieties opaque enough to blot out the disc of the sun when interposed between that orb and the eye. Not that all black glasses by a long way are transparent to invisible radiations, but there are some easily obtained in commerce. It is only necessary to ascertain their transparency by the means I have described. All the experiments set forth in this chapter are based on the use of bodies sensitive to radiations of great wavelength, but this sensitiveness is only very great for radiations hardly exceeding 3 microns. Now, those emitted by bodies at a relatively low temperature — the human body, for example — are of much greater wavelength, and do not impress phosphorescent matter. If we could discover a body sensitive to those radiations, nothing would be easier than to photograph a living body in the dark without any other source of light than the invisible light it is continuously emitting. Down to the absolute zero of temperature, all bodies incessantly radiate, as has been seen, waves of light invisible to our eyes, but probably perceptible by the animals called nocturnal and capable of finding their way in the dark. To them, the body of a living being, whose temperature is about 37° C, ought to be surrounded by a luminous halo, which the want of sensitiveness of our eye alone prevents our discerning. There does not exist in nature, in reality, any dark bodies, but only imperfect eyes. All bodies whatever are a constant source of visible or invisible radiations which, whether of one kind or the other, are always radiations of light. As the invisible infrared rays form the greater part of the solar spectrum, it may be imagined that they play a considerable part in meteorology and in vegetable physiology. Their properties in this respect are very little known. Hitherto, their caloric actions which were long since observed, and their power of passing through a great number of opaque bodies as brought to light by my researches have alone been studied. It occurred to me to also study some of the physiological actions of the infrared rays — that is to say, their influence on vegetable life, and to inquire especially whether they might not exercise some of those antagonistic effects established during the study of phosphorescence which will be studied in detail in the next chapter. For want of materials, I was unable to proceed very far in these researches. We know that visible light has two opposite actions on the life of vegetables — the one oxidation or the respiratory function, the other reduction or the chlorophyllic function. The first of these may be accomplished in the dark. By its means the pant absorbs oxygen and exhales carbonic acid, as do animals. The chlorophyllian function, the converse of the above, on the contrary, can only take place in the light, and is due solely to absorption. Thanks to this, the plant decomposes carbonic acid and fixes the carbon in its tissues. The luminous energy stored up by the chlorophyll enables the protoplasm of the plant to transform mineral substances into those organic products, complicated and charged with energy, without which the life of the higher animals would be impossible. Vegetables thus establish a permanent link between the mineral and the animal world. Thanks to them, matter passes without ceasing through different forms of life rising progressively from the mineral to the higher animal. In this perpetual cycle, two elements of transformation, bacteria and chlorophyll, play a preponderant part. The bacteria bring back to the mineral state the products used by the functions of the higher lives, and the chlorophyll raises the mineral substances to the organized state. Bacteria are able to pursue their destructive action in complete darkness. Chlorophyll is obliged to absorb the luminous vibrations before playing its part. The vegetable world therefore represents a transformation of light. 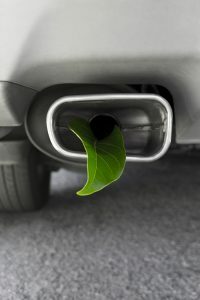 It is the luminiferous ether, absorbed and transformed by plants, which ripens our harvest and makes green out forests. Life represents one of its transformation. It cannot, however, be said that the very great energy stored up by the plant is entirely due to the very slight energy produced by the absorption of the luminous rays by the chlorophyll. The rays absorbed, no doubt, act by provoking liberations of intra-atomic energy, the mechanism is which is not comprehended. The vibrations of the ether probably release forces which thousands of ages have in times past accumulated within the atom. What effect have the various visible or invisible radiations on the life of vegetation? The part played by the first named has been studied by several generations of seekers. That of the second is largely unknown hitherto by reason of the insufficiency of the methods employed to determine its action. The value of experiments always depends on the choice of methods. Those employed to study the actions of the various parts of the solar spectrum, especially the infrared rays, on plant life are unfortunately marred by causes of error which take away all value from many of the results — contradictory moreover as these are — obtained up to the present time. It is easy to put these in evidence. To observe the properties of the various radiations it was natural to think of decomposing light by a prism, and of placing the plants under the various radiations thus separated. The decomposition of carbonic acid by the leaves, for instance, is measured by introducing them under the different pencils of light which the prism has separated. This method, so simple in appearance, gives rise to causes of considerable error. The first and most serious is that the light, when sufficiently dispersed to spread over a certain surface, loses its intensity to an enormous extent. Now, the influence of intensity in chemical reactions is, as has been shown, of capital importance. When operating with a prism one is inevitably led to seek in the color of the ray the cause of effects due, in reality, to differences of intensity. 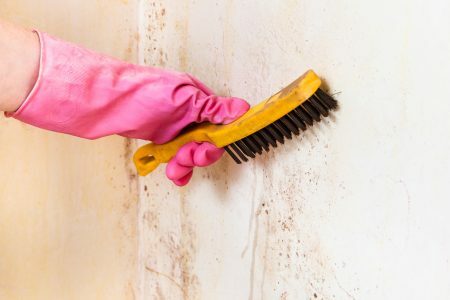 It has long been known that in the faint light of a room plants decompose very little or even no carbonic acid at all. Yet this light contains the rays necessary for its decomposition. The light fails to produce this only through lack of intensity. This first cause of error would of itself be sufficient to vitiate all the consequences drawn from the facts observed. Moreover, it is not the only one. Prisms, especially those made from flint, generally chosen on account of their great power of dispersion, absorb nearly all the ultraviolet rays, the action of which is very important, and a great part of the infrared. No doubt these two drawbacks can be theoretically remedied by using quartz or rock-salt prisms, which in fact has been done. But the dispersive power of these substances is very small, and their spectrum consequently is small in extent. The causes of the preceding errors, and of numbers more of which the complete details would be too technical to be given here, explain sufficiently the divergences in the results obtained by former observers. 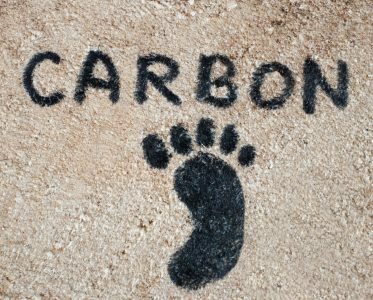 According to some, the decomposition of carbonic acid by the plant — that is to say, its most important function — is nil in the red, and considerable in the green. According to others, it is exactly the contrary — the action is nil in the green, and at its maximum in the red. This last result is, however, the most probable, seeing that it is in the red and its neighborhood that are to be found the bands of absorption of the chlorophyll. To sum up, there is little exact information to be gained from the studies effected by the use of prisms. The results obtained by replacing the prism by colored glass are no better. This is a pity, for the process is practically very simple, since all that one has to do is cover over the greenhouses in which the experiments are conducted with panes of glass of different color. This method is the result of an error into which many experimenters have fallen. Because the eye sees but one color through a colored screen — blue glass, for instance — it is imagined that this screen only allows the one color perceptible by the retina to pass through. Now this is not the case at all. No glass, except the red, is monochromatic. All allow the whole of the spectrum to pass through. This is easily verified by holding colored glass between the sky and the slit of a small direct-vision spectroscope. I have had occasion to examine a considerable quantity of colored glasses, and have observed that all except the red allow the whole of the spectrum to pass, and only weaken the relative intensity of its various parts. By covering a greenhouse with colored glass, then, we do little but reduce unevenly the intensity of the various luminous rays. When a plant is placed under colored glass, it is almost the same as placing it in a badly-lit room. The use of colored glasses to separate the various radiations carries with it yet other sources of error. 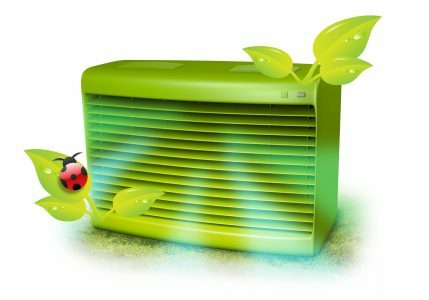 As they absorb the infrared rays very unequally, we may attribute to the influence of light what is due to that of heat. Between one glass and another, the differences of caloric action are considerable. By placing a thermometer in boxes with a capacity of about one cubic decimeter, each one covered by different colored glass and thus forming small glass-houses, I observed that the internal temperature, which in the sun was 30° C, went up to from 10° to 15° in 10 minutes, according to the temperature of the glass. The only experiments realizable with colored glass are those made with red glass. This is, as has been said, almost monochromatic. The experiments effected in greenhouses covered with such glass at the observatory of Juvisy seem to prove that a certain number of plants receive in red light a much more considerable development than in ordinary light. Such, for instance, is the case with sensitive plants, lettuce, gladiolas, geraniums, begonias, potatoes, male ferns, etc. Some (beetroot, pansies, wallflowers, etc.) on the contrary, thrive less under it. Were we to admit as demonstrated that certain plants develop much better in red than in white light, the conclusion must naturally be adopted that, as in the case of phosphorescence, certain rays have a contrary effect to that of others. In white light, a plant evidently receives as many red rays as under a red glass, since this last simply eliminates from the light all the rays saving the red. If the fact of this elimination alone favors in large measure the development of the plant, it is because the eliminated rays act so as to weaken the action of the red. 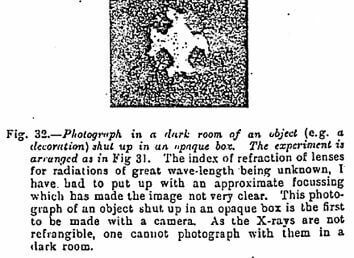 This would be exactly what is observed with regard to the photographic plate, as we shall see in the next chapter. This plate becomes much more luminous when we withdraw certain antagonistic rays from the light which strikes it. The antagonistic actions observed as regards phosphorescence thus exist also for plant life. Green has already observed that the violet and the ultraviolet rays tend to destroy the diastase, while its production increases under the influence of the red. It will be seen further on that, in experiments made by me, the infrared destroys the green matter in plants and other substances formed in the luminous part of the spectrum. In the preceding researches, hardly anything but the visible rays of the spectrum have been dealt with. The only means known in former times of studying the infrared rays being separation by the prism, and as this collects the radiations of this end of the spectrum on a very restricted surface, we could scarcely determine their action. The fact, brought to light by my researches, of the very great transparency of black paper, ebonite, etc., to rays of great wavelength, enables them to be easily separated from visible light. A greenhouse is simply covered over with one of these substances — for choice, the black paper. It is thus plunged in utter darkness, but bathed with invisible light. In reality, the greenhouse has only by this means been deprived of about a tenth of the total light (visible and invisible) which it would have received from the light of the sun. It probably need hardly be remarked, that there can be no comparison made between an enclosed place in which there only penetrate dark radiations of great wavelength and the cellars in which the action of darkness on plant life was studied. The darkness of the greenhouse is the same to the eye as that of the cellar, but the effects produced must necessarily be very different, since the greenhouse is bathed in the waves of an invisible light which the cellar does not contain. I have, unfortunately, not been able to pursue my experiments on this subject for a long time, the garden in which they were carried out only having been placed at my disposal for one season. 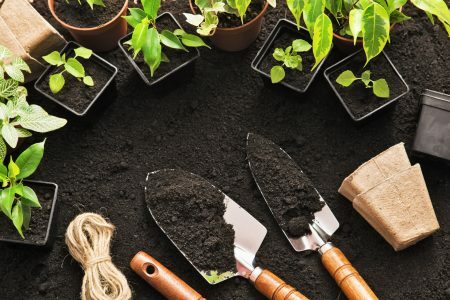 They may, perhaps, render service to horticulturists by giving them the means of modifying the color of certain plants, and the taste of different fruits. It may be asserted in a general way that the infrared up to 2 or 3 microns destroys the green matter formed under the action of light and also certain coloring matters, while it reduces the quantity of sugar, suppresses the sapid matter, and thus transforms the taste of different parts of the plants. (1) Seeds of various plants – Lettuces, cucumbers, grains, etc., set to germinate under glass bellglasses, covered with black paper, transparent to the infrared, all germinate quicker than by the light of the sun and then wither and die in abut a fortnight. (2) Plants developed in the light of day, and then exposed to the black light – The various plants behave very differently. Here are a few examples: Reine marguerite does not flower. Begonia withers in about 10 days. Strawberries are not modified, and ripened very well. Cucumbers and haricots die from the withering of their leaves. (3) Fruits and different parts of vegetables – Artichoke tops enveloped in black paper, transparent to long radiations, blanch completely in a few days, but develop better than their neighbors exposed to daylight, while gaining much in quality. Pears, peaches, and grapes blanch somewhat but develop very well. They were covered up as soon as they began to form. These three forms of fruit present the peculiarity that they lost a part of their sweet taste and their aroma. Tomatoes lose their red color, and become completely white. I repeat that I only give these experiments as general indications. In fact, they deserve the criticisms which could have been avoided had I been able to repeat them. The comparative method, indispensable for drawing conclusions from experiments in which several factors may operate, demands that there should be only one condition varying from one experiment to another, so as to be able to attribute differences in results to the difference of condition alone. Now, in these experiments, we have not always taken into account aeration, heat, etc. As the different parts of the light exercise, as we are about to see, strongly antagonistic actions, it would be very useful, both in the light baths now much used in medicine and in biological researches, to be able to separate the rays so as to study the part played by each of them. (1) Entirely without screen – The parts which act (the whole of the solar spectrum) range from 5 microns to 0.295 microns. (2) Screens formed of thick window glass – The greater part of the uv rays and the ir rays beginning at 2 microns are suppressed. (3) Screens formed of red glass – Complete suppression of all the uv and of all the visible spectrum as far as the red. The only rays which act are the red and the infrared as far as 2 or 3 microns, according to the quality of the glass. (4) Screens formed of black paper or ebonite – Suppression of all the visible spectrum. The active rays are infrared. (5) Screen formed of a strip of metal – No ray traverses the metal, but it becomes heated, and emits from its underside radiations of 6 microns and beyond, according to its temperature. These radiations do not exist in the solar spectrum, but it would be of interest to ascertain their action, and discover whether it is simply caloric. Notwithstanding their insufficiency, these researches give us a presentiment of the great interest of the researches for which, through lack of a suitable laboratory and of sufficient means, I have only been able to sketch the way. The study of the infrared has led us to observe that it often exercises actions diametrically opposed to those of the other extremity of the spectrum, destroying, for instance, an action produced under the influence of this last. The discovery of these antagonistic actions of the two extremities of the spectrum is contemporaneous with the origin of photography; but we are compelled to imagine that the experiments effected to prove this phenomena were not sufficiently demonstrated since their interpretation has log been disputed, and was again challenged recently in a long discussion before the Societe de Physique. The slow actions of inversion following one another in photographic impressions seem, in fact, to lend themselves to various interpretations. The question, evidently, can only be entirely elucidated by finding means of rendering instantaneously evident these antagonistic actions. It is these instantaneous effects which are realized in the experiments which follow. The first observations on phosphorescence made it plain that all one end of the spectrum, comprising the blue, violet, and ultraviolet rays, illumine a phosphorescent screen taken out of the dark. The other end of the spectrum (the green, red and infrared rays) on the contrary, extinguish phosphorescence, and never produce it. Certain rays therefore act as illuminating and others as extinguishing rays. These two actions are plainly antagonistic but as they are very slow in the case of most phosphorescent bodies, they lend themselves to various explanations. To put them in evidence, we needed a body extremely sensitive to those radiations which extinguish phosphorescence. Zinc sulfide with green phosphorescence is the only body actually known to possess this property, and all my experiments have been made with screens coated with this sulfide in the manner described in a former chapter. If it is exact that certain rays produce phosphorescence, and that others acting in the opposite direction consequently extinguish it, it is evidence that by depriving the light of these extinguishing rays by the interposition of suitable screens, we may increase the brilliancy of the phosphorescence on a given screen. We shall see that this is really so, and that, for example, a body which does not become illuminated behind a glass trough of quinine sulfate, will become so if we keep back, by means of appropriate screens and without changing the position of the trough, certain rays from reaching its surface. 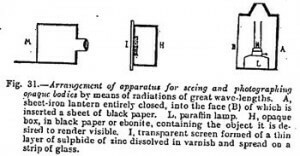 E. Becquerel formerly pointed out that a screen of phosphorescent sulfide exposed to the light behind a trough of quinine sulfate, did not become illuminated, and he attributed this phenomenon to the absorption of the ultraviolet rays by the quinine sulfate — rays which, according to him, “are the principal ones to excite phosphorescence”. This explanation is wholly insufficient, for if the ultraviolet rays are able to excite phosphorescence, they are not by any means the ones that excite it most. Phosphorescent bodies are much better illumined by the blue and violet rays — that is to say, by the part of the spectrum comprised between the lines G and H. This point must be borne in mind in order to understand thoroughly the experiments which follow. By varying the duration of the exposure of the phosphorescent screens we can easily take note of the sensitiveness of the sulfides in the various regions of the spectrum. With the projection spectroscope and the condenser above described (Figure 21), a screen of calcium or zinc sulfide is impressed in four seconds between G and H, and not at all in the ultraviolet. There must be an exposure of several minutes to obtain an impression in this last region. On the blue side the prolongation of the exposure extends the impression nearly up to the line F, but no farther. Let us now take a screen of zinc sulfide, a body so little sensitive to violet rays that it does not light up at all behind the trough of quinine sulfate. We will now compel it to be brightly lit up behind this trough by simply superposing on the latter another trough which does not arrest the blue rays, but does stop the extinguishing green, yellow, red and infrared rays. This experiment, and others of the same order showing distinctly the instantaneous action of the extinguishing and illuminating rays, are decisive. For lecture purposes they amy be thus simplified. We expose to sunlight (1) a screen of zinc sulfide, and (2) by the side of it another screen similar, but placed behind a flat-sided flask filled with a saturated solution of ammoniacal copper sulfate. This solution is almost opaque to the eye when in a stratum of about 2 cm. Leaving the flask in its screen, it is taken with the other into the dark, and then it will be observed, after withdrawing the flask of copper sulfate, that the sulfide screen placed behind this last, notwithstanding the apparent obstacle it presented to the passage of light, is much more luminous than the screen directly exposed. This difference is merely due to the fact that the copper sulfate has absorbed the extinguishing rays, and only allowed the illuminating ones to act. On the screen exposed directly to the sun the brightness of the phosphorescence is much less because a part of the effect of the illuminating rays has been destroyed by the extinguishing rays mingled with them. 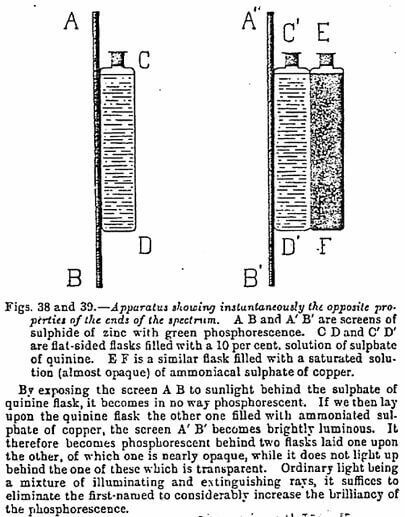 We may now return to the description of the experiment with the quinine sulfate trough, behind which we can light up or not at will a screen of phosphorescent sulfide. No experiment shows more strikingly the parts played by the extinguishing and by the illuminating rays. Behind a flat flask containing a perfectly clear 10% aqueous solution of quinine sulfate, acidified by sulfuric acid to the point of complete solution, we place a screen of zinc sulfide and expose the whole to the sun. 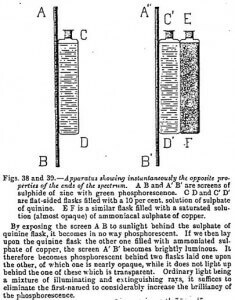 Notwithstanding the complete transparency to the eye of the quinine sulfate, and however prolonged may be the exposure, we observed on taking the flask and screen back into the dark that the zinc sulfide exhibits no trace of phosphorescence. This absence of phosphorescence is due solely to the fact that as the quinine sulfate retains a part of the illuminating rays and allows all the extinguishing ones to pass, it is these last which prevail. To prove that this is really so, we will again expose to the sun our zinc sulfide screen, placed behind the trough of quinine sulfate; but in front of this latter we will again place the trough of ammoniacal copper sulfate. Then, taking the trough back into the dark, we observe that our sulfide screen is brilliantly illumined, although it has only received the light through an almost opaque liquid. The explanation is easy. The quinine sulfate held back, as I said, a part of the illuminating rays and allowed to pass all the extinguishing rays; accordingly, it prevented all phosphorescence. By placing in front of it a trough of copper sulfate we suppress the great majority of the extinguishing rays (red and infrared) and consequently the blue and violet illuminating rays are allowed to act. The sum of the power of the illuminating exceeding that of the extinguishing rays, the screen becomes phosphorescent. If we had replaced the copper sulfate trough by a blue glass placed in front of the quinine sulfate, we should still have had illumination, but weaker than with the copper sulfate, because the blue glass stops the extinguishing rays very insufficiently, especially those of the infrared region. What has just been said regarding the action of the extinguishing and illuminating rays on phosphorescent bodies allows us now to comprehend the part taken by the screens interposed between phosphorescent bodies and the sources of light. Light being a mixture of radiations capable of acting in contrary directions, and its composition differing greatly with the sources employed, or with the filtering screens interposed between the light and phosphorescent bodies, the explanation of the facts I am about to enumerate will be easily arrived at. (1) A screen of zinc sulfide is much more illuminated in the dark than in sunlight. (2) The same screen is more illuminated under a blue glass in the dark than in sunlight. (3) Behind a trough 2 cm from back to front, containing an ammoniacal solution of copper sulfate, the illumination of the screen is still more intense, but on this occasion it becomes brighter in the sun than in the shade. (4) Behind a trough of alum or of iron sulfate the illumination of phosphorescent bodies is reduced instead of being increased. 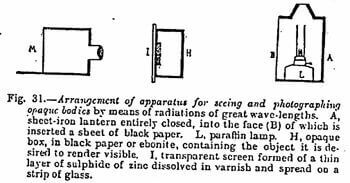 (5) By the light of a paraffin lamp or of a candle the illumination of a screen of zinc sulfide is almost nil, and on presenting to these sources of light a screen insolated by daylight, it at once becomes extinguished. The same phenomenon is not observed with a screen of calcium sulfide. Here are a few figures giving the luminous intensity of a screen of zinc sulfide illumined under most of the conditions we have just examined. The brightness of the sulfide insolated by the sun without any screen interposed is about 0.002 B (1/5000 candle power), c.p.). Taking this intensity as our unit, we see in the following table the increase in brilliancy produced by the interposition of various screens between the source of light and the sulfide they show us, for example, that the brilliancy of the zinc sulfide behind a trough of copper sulfate is 14 times as great (3/100 c.p.) as when it has been illumined in the sun without the interposition of any screen. These differences are not observed with other sulfides by reason of their lower degree of sensitiveness to the extinguishing action of radiations of great wavelengths. In order to observe them, then a substance like zinc sulfide, sensitive at once to the extinguishing and illuminating rays, was necessary. Its brilliancy under the influence of light always represents the difference between the action of the first-named rays and that of the second. We see therefore that it is solely on the relation existing in a source of light between the various radiations of which it is composed that the illumination of a phosphorescent body depends. By varying the relation we vary the brilliancy. This explains the action of a cobalt blue glass screen. It weakens the extinguishing radiations, and consequently increases the illumination. Copper sulfate, which stops the extinguishing radiations in a much greater degree, likewise greatly increases the illumination. Iron sulfate and alum act but slightly because, although they stop a portion of the infrared, and also a part of the ultraviolet, which is an illuminant, they stop neither the red nor the green, which are extinguishers. As regards the illumination of zinc sulfide being greater in the dark than in the sun — a very curious fact which has escaped all other observers — the explanation is exactly the same. Diffused light is blue light reflected by the sky. From spectroscopic observations of already ancient date, it contains relatively many fewer red rays — and probably also fewer infrared ones — than the direct light of the sun. Notwithstanding, therefore, the higher luminous intensity of the sun, the sulfide will be more luminous in the shade. This explanation is really the correct one, for if we withdraw from the solar rays by our copper sulfate solutions which act as extinguishers, the illumination will at once become much more brilliant in the sun than in the shade by reason of the greater intensity of the illuminating rays. The same reasoning explains why zinc sulfide not only does not become illuminated in the light of a strong lamp, but goes out when exposed to it, if previously illuminated. In our artificial systems of lighting nine-tenths of the rays emitted are extinguishing infrared rays. The action of the illuminating rays is, then, destroyed by them. Even by interposing a thick trough of copper sulfate, only a very weak illumination is obtained because, in view of the predominance of the infrared rays, it is impossible to stop them in sufficient proportion. Moreover, the interposition of this trough much reduces the intensity of the illuminating rays. Now, the degree of phosphorescence of a sulfide is, within certain limits, in direct ratio to the intensity of the source of light which has illuminated it. With feeble sources of light, phosphorescent sulfides so not become saturated, whatever may be the duration of the exposure. All that I have just said regarding zinc sulfide is not applicable, I repeat, to other phosphorescent sulfides by reason of their slight sensitiveness to great radiations, especially to the infrared, and this is why a screen of calcium sulfide does not become appreciably brighter behind troughs which stop the extinguishing radiations. The action of these last is too slow to combat that of the illuminating radiations which already have had time to act. The eye is even more insensible to infrared radiations than the phosphorescent sulfides other than zinc. If the sensitiveness of the retina were as it is for this last body, the algebraic sum of the effects produced by radiations acting in contrary directions, it would suffice to interpose suitable screens between the eye and a landscape, for the apparent brightness of this landscape to increase in enormous proportions. It would then be perfectly unnecessary to use electricity to light our streets. Such different actions from the two extremities of the spectrum are not observed in the case of phosphorescence alone. They also exist in photography, as I shall proceed to show. 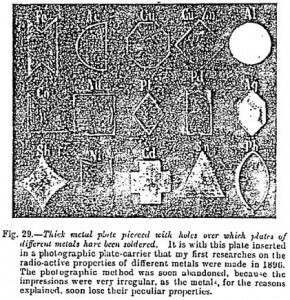 If photographic plates had, to the destructive action of the infrared rays, a sensitiveness equal to that of zinc sulfide, it would be possible to greatly increase, as we have done for the latter, their rapidity of impression by placing in front of the camera screens which stop the extinguishing rays. But in this case, because the photographic plate, although very sensitive to the visible rays, is not so to the invisible, which are thus unable to act. It is easy, however, by bringing in the action of time, to show that the extinguishing rays can destroy the impression on the plate produced by the illuminating rays. Let us place in a photographic dark slide a plate of ebonite which may be 1 mm thick, but which it is better to reduce to ½ mm, so as to obtain sharp outlines. On or under this plate, we will glue a cross cut out of a sheet of tin. Behind the ebonite plate I will introduce in the dark a gelatino-bromide plate of very fine grain, previously clouded by exposing it for 2 seconds to the light of a candle. I close the frame and expose it for one hour in sunlight. The infrared rays pass through the ebonite and destroy the cloud produced on the plate by the previous exposure. In the part protected by the metallic cross they will not have acted, and that is why, on developing the image, we shall find a reproduction of the metal cross on a very light ground. The ebonite plate may also be replaced by two or three superposed sheets of black paper. There is no analogy between this experiment and the investigations we obtain by over-exposing a plate lighted by the blue or violet rays. The infrared rays which destroy a photographic impression, never produce one. This property is limited to the infrared, for the red rays can, with a sufficiently long exposure, impress a plate. If, in fact, we prolong the exposure under red glass, the plate becomes first clouded and afterwards automatically unclouded. But in this experiment the phenomena of inversion observed with all radiations, and constituting a very different order of phenomena, come into play. In the visible part of the spectrum, any radiation whatever destroys the impression produced by greatly prolonged exposure — a fact easy to verify by the spectroscope. We will summarize in the following table the antagonistic properties of the two extremities of the spectrum. A. Cannot pass through opaque bodies – A’. Passes through most bodies opaque to the eye, metals excepted. D. Produces the majority of reactions on which plant life depends – D’. Destroys a great number of reactions produced by visible light. Destroys especially the coloring matter of plants. E. Energetically dissociates matter, especially throughout the ultraviolet extremity – E’. Has no dissociating action on matter. The reasons for these differences cannot yet be sought; if the “How” of things is sometimes accessible, their “Why” is not yet so.